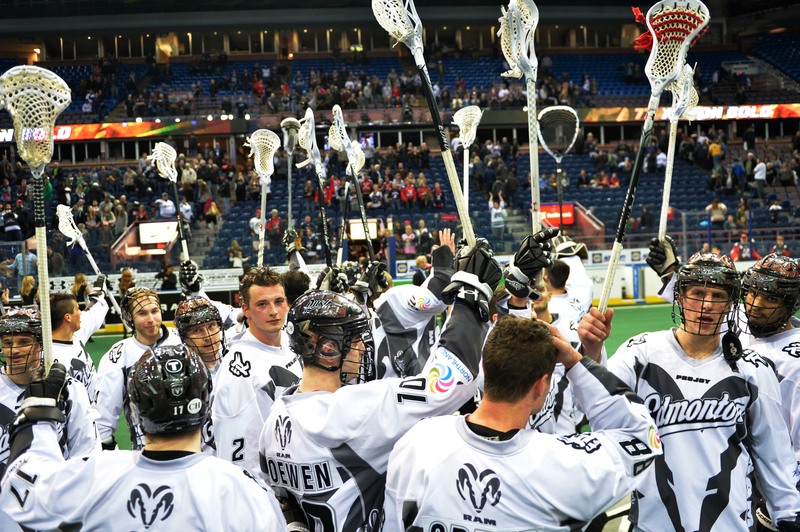 In a game that had a playoff atmosphere the Edmonton Rush defeated the Colorado Mammoth 13-12 in an exciting contest that saw the Rush clinch the Western Division title. Before the 7,645 faithful Rush fans had a chance to settle in their seats the Mammoth had taken a 1-0 lead on a goal by Jeremy Noble. It didn’t take long for Ben McIntosh to tie the game on a pass from Mark Mathews that beat Dillon Ward up high. The teams continued a fierce pace that saw them exchange hits and goals until the Rush slowly started to pull away with a 6-4 halftime lead. The second half started with Edmonton taking command of the game in all facets and built a comfortable 13-6 lead at the end of the third quarter. Mark Mathews had four goals to give him a brief lead in the NLL goal-scoring race over the Mammoths Adam Jones who had a big night himself. Once it was announced to the Edmonton crowd that Mathews had taken the goal scoring lead, Jones caught fire and scored a couple of late goals to bring his total to seven for the game and retake the scoring lead from Mathews. As dominating as the Rush defence and goaltending was in the two middle periods, it was just as porous in the final frame that saw them give up a total of six unanswered goals and put a scare into the home crowd. The Rush close out the season on the road for their final two games before returning to Northlands Crystal Glass Field to play the winner of the West division semi final between the Mammoth and either Calgary or Vancouver.